While most tricks you can do with the classic eight skills are fairly well-known among the veterans here in the forum, I believe one reason why the new NeoLemmix skills are getting used less frequently is the fact that people simply have fewer interesting ideas of what to do with them. So I thought, if the old skills have their own thread for discussing all the tricks you can do with them, there should also be one for the new skills, right? Disclaimer: I'm using example pictures from my packs "Pit Lems", "Lemmicks", and also the upcoming "Lemmings World Tour" here while explaining part of the solution, so... spoiler warning! In my opinion, gliders are the skill with the most design potential by far among the new skills. Their ability to move diagonally downwards or upwards (with updrafts) in any direction opens up to directions of movement lemmings never had access to before. - The diagonal movement can be used to get a glider ahead of the crowd if there's no way to hold the crowd back. - Gliders can be used to recruit a second pioneer lemming (see below). - Just like floaters, gliders can fall into exits without terrain underneath. - The fact that they open up their parachute just after a while of falling, like floaters do, can be exploited to create one-way updrafts. - Similarly to a climber going over a wall, turning around and mining down to allow the crowd to follow, gliders can do the opposite: Go across a gap, turn around and build in the direction they were coming from. Floaters can only do this if they land on solid ground, and then turn around to build a splatform. A one-way updraft. A glider coming from the left will be able to cross over to the right side, but not the other way round, because the parachute won't open up in time before the lemming is out of the trigger area. A builder from the left can't cross this gap. A glider needs to hover over, turn around, and then build from the right. Perhaps the most powerful skill among the new ones, probably due to its similarity to the builder. Even though it kills a lemming, the fact that it creates terrain out of thin air and a single use can break falls of almost the entire height of a normal level easily makes up for the loss. Like the builder, its potential for multi-purpose use is what makes the stoner so powerful - and therefore also in need of rigorous backroute checking whenever it's introduced into a level. - Stoners can hold back climbers, like regular blockers - but contrary to stackers. - They can however also do this on walls a climber would otherwise climb up, like bombers! - Stoners can bridge gaps like builders, although they're obviously not very effective for that purpose. - Stoners interact with builders very well, though, compensating for the builder's height gain whenever it is unwanted by creating "stepping stones". Lemorials (Pit Lems, LOL 08). The entire level can be solved using only stoners. A single builder cannot cross this gap; a "stepping stoner", akin to the Mayhem level "Stepping stones", is required as a stop in the middle. Sometimes it may even be necessary to dig into the stoner, in order to get low enough in order to make enough space for the second builder to finish its work. Even at release rate 1, as long as there's only a single hatch (which is still the most common scenario), at least one lemming will always slip past the stacker. As a player, you will often hate this - as a level designer, you should absolutely love it! - In pioneer-style levels, this isn't a problem at all: The lemming slipping past simply becomes the pioneer you needed anyway. - When using a stacker to block of a path where no lemming at all is supposed to - e.g. on the side behind the hatch, facing away from the exit - you usually do not want a lemming slipping by. Again, it pays to make the second lemming the pioneer, so that there is more space between the first lemming (the stacker) and the third one, who should have a mucher harder time now getting past the stack before it's completed. - Stackers are blockers that do not hold back climbers. You can create nasty surprises this way where climbers end up killing themselves while everyone else is safe! - At the same time, stackers allow to easily recruit a second pioneer lemming by using a climber (see below). This is a huge advantage compared to blockers or stoners, which usually have to be removed or built over, both of which contain the danger of further lemmings slipping by. - Stackers can make climber-unfriendly walls climber-friendly by just stacking a bunch of stacks on top of each other to create an almost straight wall. - In combination with walkers, stackers can be used for the infamous stacker staircase, which gains height more quickly than regular builder staircases, but does not extend very much in the horizontal dimension. This is the vertical equivalent to platformers. - A slight variation of the stacker staircase is the stacker ramp, created by using stackers and fencers. - The question of how to get rid of the stack to free the crowd is also a challenge in and of itself. Bash or fence through? Build or platform over it? Have a climber climb on top and bomb or dig down? It's not always that obvious which skill has to be saved for last here, contrary to blockers which are usually either blown up, turned into walkers, or freed with a basher or miner (rarely a digger). - Water breaks a swimmer's fall, like updrafts do for regular lemmings (and always so, if they land inside the updraft). Contrary to updrafts however, water is deadly to all non-swimmers, so usually building across it is required - which takes away the beneficial effect of breaking falls. You can force the player to think about how to properly sequence this! - Both swimmers and gliders will always move to the top of the trigger area of the respective water or updraft eventually. This can be used to gain height. - Like gliders, they can travel across gaps that can't be accessed from one side to close these gaps from the other side. Use a swimmer to break the fall. 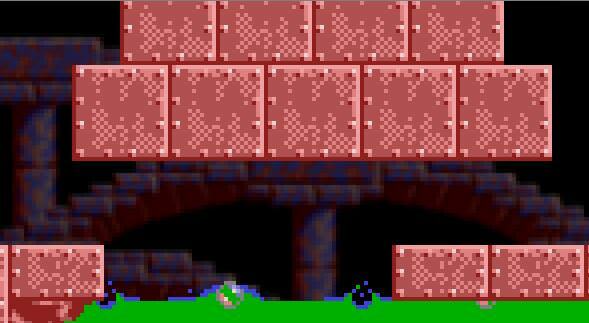 A platformer from the left can't bridge across the water. A swimmer needs to cross it, turn around, and then platform from the right. - When provided instead of builders, the fact that platformers in NeoLemmix do not gain height can be used as a real drawback for players. Not only is it much harder to create splatforms this way - how do you even get out of a pit if just a single lemming happens to fall into one? - On a related note, platformers can't be assigned on even ground. This is especially relevant when working with the backwards walkers or turn around on assign gimmicks in NeoLemmix 1.43, as can be seen in my pack "Lemmicks"; but also when you want to assign cloners to a platformer, or just use it to turn the lemming around in general. - As a level designer, plan the width of your gaps precisely, depending on whether you want the platformer to turn around at the end or not. Also keep in mind a player always has the option of having the lemming walk up to the final pixel of terrain before assigning the skill, so that you don't experience any surprises that change the behaviour of this skill completely! Fencers are not only miners in reverse; they are also an excellent way to create self-made one-way fields. - The "miner in reverse" allows for a new twist on the classic "send a climber up and have him mine down to get the crowd up, too" paradigm: Send a floater / glider / digger down, and use the fencer to create a safe passage for the others from below. - Making two fencers go through each other's paths is a lot harder than with builders or miners, but it can be done. The shaft behind one fencer needs to be resealed with terrain, though, in order for the other one to pass and continue his task. - Ever freed a blocker from below? Fencers can do this just like miners can! - The option of inverting one-way down arrows to create one-way up arrows which only fencers can pass through gives this skill an actual monopoly. - If a fencer's tunnel ends high enough, it may not be possible to return into the tunnel from the other side. This gives the fencer potential to be used as a blocker, since blockers act like one-way fields attached to lemmings. - Like with the stacker though, these "one-way fields" usually still can be overcome by climbers, who will be able to climb into the tunnel - which is obviously not possible with actual one-way fields . A single fencer from the left can allow lemmings to pass to the right without any lemmings from the right passing through to the left. This is not possible with a single basher. The cloner has absolutely no design space on its own, apart from compensating for lost lemmings. But once you couple it with all the other skills, its potential grows exponentially! - The potential for synergies with builders, miners, and bashers is almost infinite. - But also stackers shouldn't be overlooked; a stoner and a stacker can create a nice pit to trap the crowd, if done correctly. - Cloning platformers often only works in very specific places, usually on poles where there is no terrain to either side. But it can be very effective, because it allows you to provide the player with what seems to be a too low count of platformers, one which has to be compensated by using the cloners! - Likewise, providing seemingly too few permanent (=athletic) skills requires the player to think through the steps in which these different permanent skills have to be assigned, so that each clone has the skills it should have, and equally importantly, doesn't have any skills it shouldn't have! Otherwise a cloner might climb over a wall it's not supposed to climb over, or glide into a trap where it normally wouldn't have landed. - Sometimes, a high drop along a straight wall has to be broken by a faller bombing into the wall, and then a climber climbing into the bomber hole to build a splatform from there. Gliders can do this out of thin air; with cloners, this is possible even if the glider is facing in the same direction as the falling bomber before. - Sometimes, two pioneer lemmings facing in the same direction are required, rather than two lemmings moving in opposite directions. For that purpose, it is crucial to find the right spot to clone so that either of the two lemmings hits a wall as quickly as possible, so that it turns around and follows the other one. While this skill may have the least design space of all, it actually lends itself very well to some of the hardest types of levels out there . - Hard for Flopsy-levels where the crowd is difficult to control, and the disarmer has to get a bunch of work done before the crowd arrives and kills itself. - Pre-placed lemmings or several hatches, where disarmers come out of one of them and need to clear the path for the lemmings from the other hatches. - The disarmer is a pickup skill; getting to collect it is the main challenge of the level, not the actual use of the skill itself. Athletic aesthetics (Pit Lems, LOL 04). A surprisingly hard level for its early position in the pack, this one is all about stalling while the disarmer is doing his job. - However, if it's crucial that the lemming can only turn around in specific places (hitting his head / tanking on steel), or that the blocker isn't supposed to be freed just by assigning a skill, then you should rather provide another builder or miner than potentially breaking the level with a walker. - The first lemming goes ahead and does its job; however, at some point you have to sacrifice it - in this case for creating a stoner. - Now you need a second pioneer lemming to finish the job - but how do you draw one out of the crowd without releasing the entire bunch? In classic lemmings, the most elegant way to do this is to trap the crowd in a digger pit and then pulling single climbers from that pit (fortunately you have the arrow keys in NeoLemmix, to make sure you only select a lemming facing in the intended direction). - Blowing up the blocker and immediately assigning a new one, costing you an additional lemming and bomber. - Temporarily freeing the blocker with a walker and then re-assigning it immediately. If several lemmings are clumped together though, they will still slip past when you assign the blocker. - Building over the blocker and cutting of the staircase to prevent other lemmings from following - an effort which is going to cost you at least two different skills. - the stacker provides a welcoming 2-in-1 solution: The first pioneer slips past by itself; the second one can climb over the stack while the rest of the crowd is held back. - When lemmings fall down a ledge, you can place a blocker / stacker / stoner on the bottom below, but still close to that ledge. As long as there are still lemmings spawning from the hatch, a glider falling from the ledge can get over the blocker / stacker / stoner, while all the other lemmings continue to get stuck behind it. Since I like to enforce "stepping stoners" frequently, I also often run into the "second pioneer lemming" issue, so it's good to see how the other NeoLemmix skills compensate for this built-in drawback of the otherwise very powerful stoner . Here's some I could think of off the top of my head. Some (but not all) of these have been used in my levels. - You can use two walkers, or a blocker and a walker, to slightly delay a lemming. - If turning multiple lemmings around, you can adjust how long between the assignments of the two skills to affect the seperation of the two (or more) lemmings. - If a swimmer encounters terrain it can't climb up onto, but that has a relatively gentle slope going downwards into the water, the swimmer can slip under it. Sometimes, a bomber or stoner can be used to create this slope. - While Strato already pointed out that gliders moving at a 45 degree angle means they get ahead of the rest of the crowd, one thing I often notice being overlooked in LPs etc - this trick works right out of the trapdoor. It can be useful if the first lemming doesn't quite get far enough ahead of the second, or in a hard-for-Flopsy level where you could combine it with a stoner (assigned just before the lemming hits the ground, but close enough that the stoner will connect with the ground, to avoid the "ohno" delay) to contain the crowd. - Gliders can bounce off blockers, walls (including walls created with stackers or stoners) or one-way-fields while in midair. - Any bomber trick that involves the OhNo part (for example, a falling ohnoer landing in an object's trigger area setting it off) works with stoners too. - The "put a few stackers together then mine/fence through it to create a ramp" trick also works with stoners. - If there is a gap between two walls that is too wide for a basher to continue, but not by much, placing a stoner in the middle of the gap may allow a single basher to carry on through. - An obstacle created by a stoner cannot get infected by zombies - though be aware that lemmings on the other side could still be affected if they're near it at the same time as the zombie. - A stoner assigned very slightly above ground level while falling (easier to do while floating, and easier again while gliding) will usually still connect with the ground, which can save some time when you need that stoner to be ready ASAP (to make a fall survivable, or to contain a crowd that's coming in very fast). - Assigning a platformer at the end of an in-progress platformer's bridge (with some slight dependency on timing) may cause the first platformer to hit the second one's bridge and turn around. - The stoner + small gap trick can also be done with stackers. - Stackers gain height much quicker than builders do, so using a stacker under a drop that's only slightly over fatal fall height can be a good way to create a splatform under urgent conditions or if you can't spare a builder. - Using a stacker next to slightly higher (but walk-up-able) terrain can be used to create a one-way obstacle. - You can bounce fencers off blockers, similar to how is done with miners. 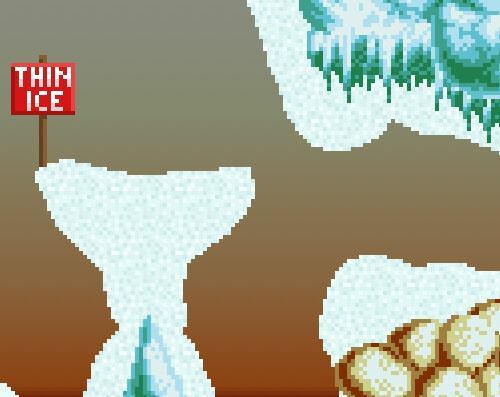 There is a Lemmings Plus Omega II level that requires this (and nothing else), very obviously so. It's meant to make a point of "here is why you should never create a level relying on this" (if you can't figure out why, remember that fencers stop if they encounter even the slightest downwards slope). - On the other hand, assuming you just need the fencer to stop (rather than to continue in the other direction), placing a blocker in front of it is an effective way to do so with (aside from losing the blocker) no other side effects. - A miner could be cloned multiple times throughout his mining path, to create multiple paths branching off in the other direction. You can achieve this with the traditional skills, specifically, using a builder from the upper ledge while placing the blocker on the lower one. It can provide interesting synergy with a level that also features zombies. Sure, you could disarm those traps, but what if you actually need them to dispose of zombies? A level late into Casualemmings provides a good example of this. It can be useful if the first lemming doesn't quite get far enough ahead of the second, or in a hard-for-Flopsy level where you could combine it with a stoner (assigned just before the lemming hits the ground, but close enough that the stoner will connect with the ground, to avoid the "ohno" delay) to contain the crowd. Thanks for your additions, namida! A couple of these I already used in my levels (especially with regard to diving swimmers), but I clearly forgot to mention them! @nin10doadict: I did it the other way round: Sure, you could kill those zombies - but what if you need them to disarm some traps first? You can delay giving the Glider to a faller in order to control where it lands (e.g. so it doesn't land on a higher platform or glide into a trap). If a Swimmer is also a Climber, it will automatically scale any vertical walls it encounters. Giving a lemming a Cloner, then Cloning their clone (or using a Walker) can double up a lemming so one of them can slip past a triggered trap. Cloning a Platformer will cause the clone to walk past the original Platformer. Walkers cannot be assigned to Swimmers - use a Cloner if you need a Swimmer going in the opposite direction. Using a Stacker right next to a Stoner will allow lemmings to walk up and over it from the other side. 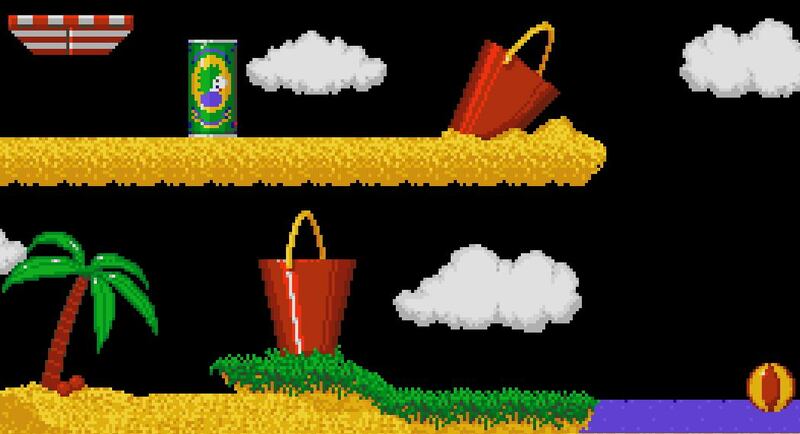 Using the Stacker one pixel away from right up against the Stoner will allow lemmings to walk up and over it from the same side. Having two stacks with a 1 or 2-pixel gap in between allows a Fencer to free the crowd without completely breaking through the 2nd stack (useful if a bridge has been built from the top of the 2nd stack or you need to prevent the Lemmings from turning back for some reason).